Please note: Beachcomber Blue is undergoing a restyle and refresh where a lot of furniture will be upgraded between December 2018 and January 2019. Beachcomber Blue is superbly situated, just a 20 min walk to Byron town centre (or 12 min walk to the famous Roadhouse, General Store or Top Shop Cafe) and is situated beachfront on Tallows Beach – one of the most iconic beaches and surf breaks in Byron Bay. 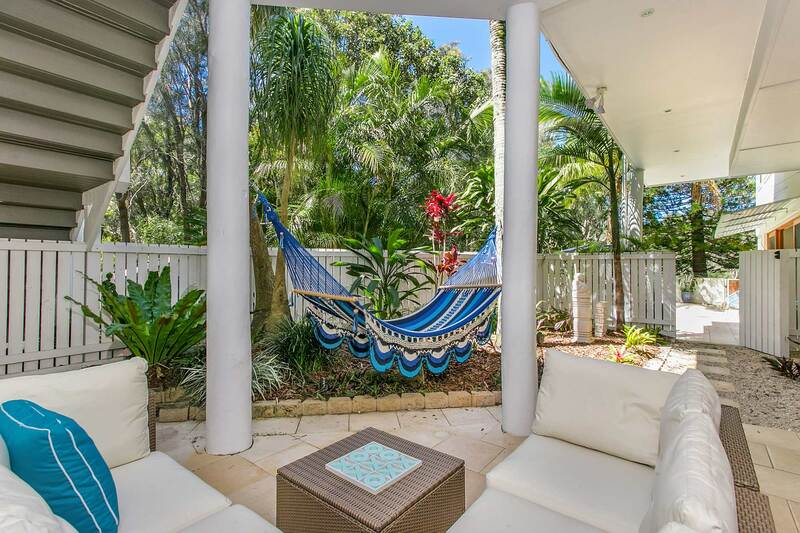 Just a sandy stroll through the private gate and your toes will be submerged in the beautiful warm Byron beach water. This stunning, expansive contemporary property is one of central Byron’s largest beachfront villa with 4 bedrooms, 5th loft bedroom and 3 bathrooms making this luxury beach home ideal for the next family holiday. There is an inviting swimming pool surrounded by daybeds, sun-lounges and multiple covered outdoor terrace areas for relaxing and entertaining. From the loft bedroom located on the top-floor of the residence, you can catch a glimpse of the magical ‘Dolphins’ surf break, where wild Dolphins frolic with surfers and swimmers, just a stone’s throw from Beachcomber Blue. Privacy, luxury, peaceful surrounds and an unbeatable location are just some of the reasons Beachcomber Blue is ideal for your next holiday! Bedroom 5 - There is also a loft room looking out to the ocean and down onto the living room with King bed that can be split into 2 king singles. There's also 2 extra pull-out trundle beds that can be set-up in this space on request making it a kids heaven. Bedrooms 2 & 3 plus the loft room share a bathroom. *Please note: Beachcomber Blue is located above another private apartment below that is rented separately and has a separate entrance and facilities. The pool is not shared between guests, it is the exclusive use of Beachcomber Blue guests. We ask guests of both dwellings to be mindful of noise between dwellings and the private residential street in which the property is located.